Guidance and Encouragement For Your Journey, With Love From Montana. 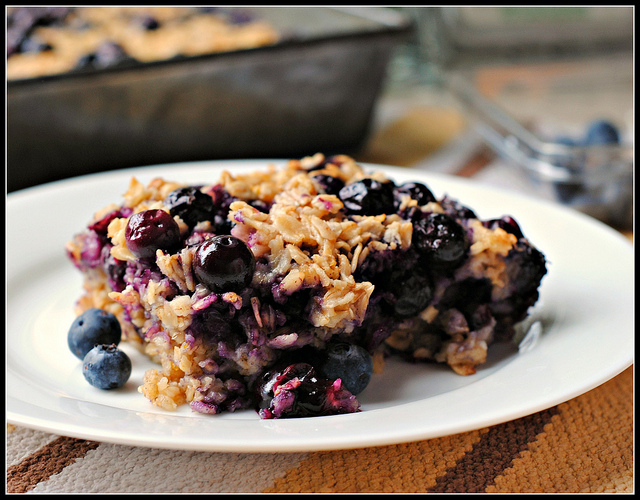 This baked oatmeal is gluten free, dairy free and egg free and FULL of great texture and wonderful flavors. Eat it hot or cold! You can even eat it with ice cream! 3. In a bowl, mix oats, chia seeds, dried cranberries, pecans, baking powder, salt, and cinnamon. Add sweetener of choice and vanilla extract while stirring. 4. Slice a banana (optional) to cover bottom of dish in layer. Top with one cup of berries and then oatmeal mixture. Pour coconut milk over the top of the oat mixture. (Be sure that coconut milk is distributed evenly). Top with remainder of berries. 5. Bake 40 minutes. Let cool 10 minutes before serving. Refrigerate the leftovers to be eaten cold or reheated the next day. PS This can be doubled into a 9×13 pan – I recommend it because you’ll want to eat more! This will be your Go To appetizer for the fall! It is so easy and so delicious and everyone LOVES it! Mix pecan pieces, maple syrup, and bourbon together in a bowl. Thinly slice the top rind off of the brie. Place the brie on a rimmed baking sheet or in a pie plate; bake until softened, 10-15 minutes. 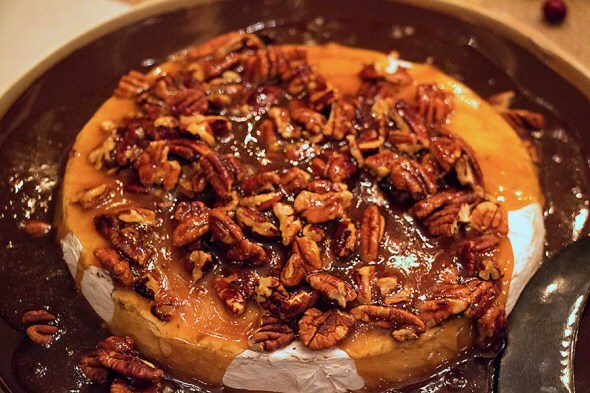 Remove from oven, pour pecan mixture into center of cheese, letting the pecans pile in the center and the syrup mixture drizzle over the sides. Return to the oven and bake another 20-30 minutes. Remove from the oven and let sit for 10 minutes. Serve with crackers. PS Buy an extra wheel of Brie. You’ll want to make this again right away! This is a SIMPLE Italian veggie soup that I always have the ingredients in stock. I haven’t met a person yet who didn’t rave about it! On medium high, heat the oil in a large stockpot. Add the pancetta and onions and cook over medium-low heat for 7 to 10 minutes, until the onions are translucent. Add the carrots, celery, garlic, 1 tablespoon of salt, the pepper, and red pepper flakes. Cover and cook over medium-low heat for 7 to 10 minutes, until the vegetables are tender. 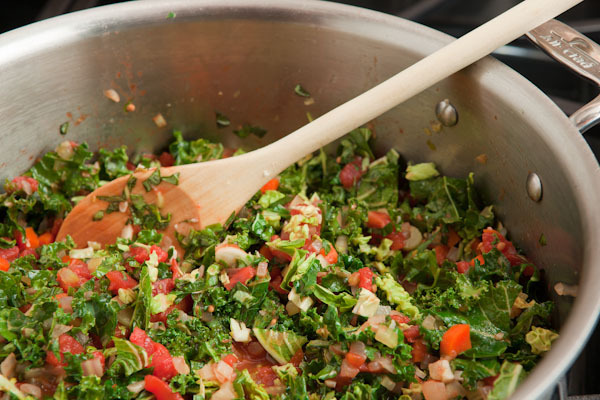 Add the tomatoes with their puree, the cabbage, if using, the kale, Italian seasoning and basil and cook over medium-low heat, stirring occasionally, for another 7 to 10 minutes. Drain the beans, reserving their liquid. In the bowl of a food processor fitted with a steel blade, puree half of the beans with a little of their liquid. Add to the stockpot, along with the remaining whole beans. Add the soup stock and bring to a boil. Reduce the heat and simmer over low heat for 20 minutes. Taste for seasoning and serve hot in large bowls sprinkled with Parmesan and drizzled with olive oil. PS Take seconds, it’s so healthy for you! Oh Yes! It’s winter and we love to eat something hearty that provides some leftovers for lunches. Over medium-high heat, saute zucchini, onions and peppers in the olive oil until tender. Add garlic; cook 1 minute. Reduce heat to medium. 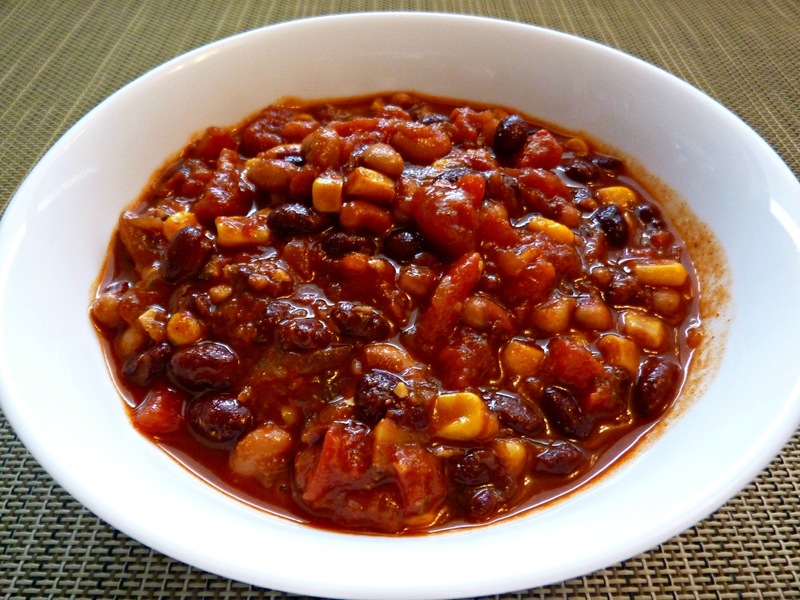 Stir in tomatoes, tomato sauce, corn, beans, jalapeno and seasonings. Bring to a boil. Reduce heat; cover and simmer 30 minutes or until heated through, stirring occasionally. PS Serve with Positively Shelle’s Cornbread or Spicy Sweet Potatoes. 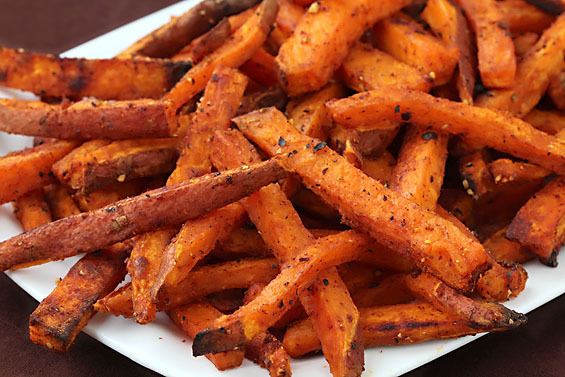 My family loves sweet potato fries! Just try to keep people from eating these straight out of the oven! Mix together olive oil, Bragg Liquid Aminos, mustard powder, paprika, thyme, and cayenne pepper. Toss sweet potatoes with mixture. Spray large baking sheet with oil. Spread potatoes in a single layer on the baking sheet. Bake for approximately 15 minutes. Turn potatoes over and bake 15 more minutes or until lightly browned on both sides and can be pierced with a fork. PS These are even great for breakfast! My friend Susan is an amazing cook as well as an amazing woman! 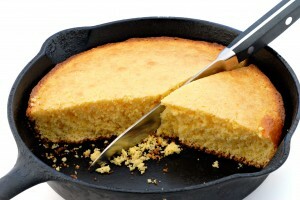 Hailing from the south, she shared this amazing cornbread recipe with me. It is so simple to make. You will never buy a mix again! 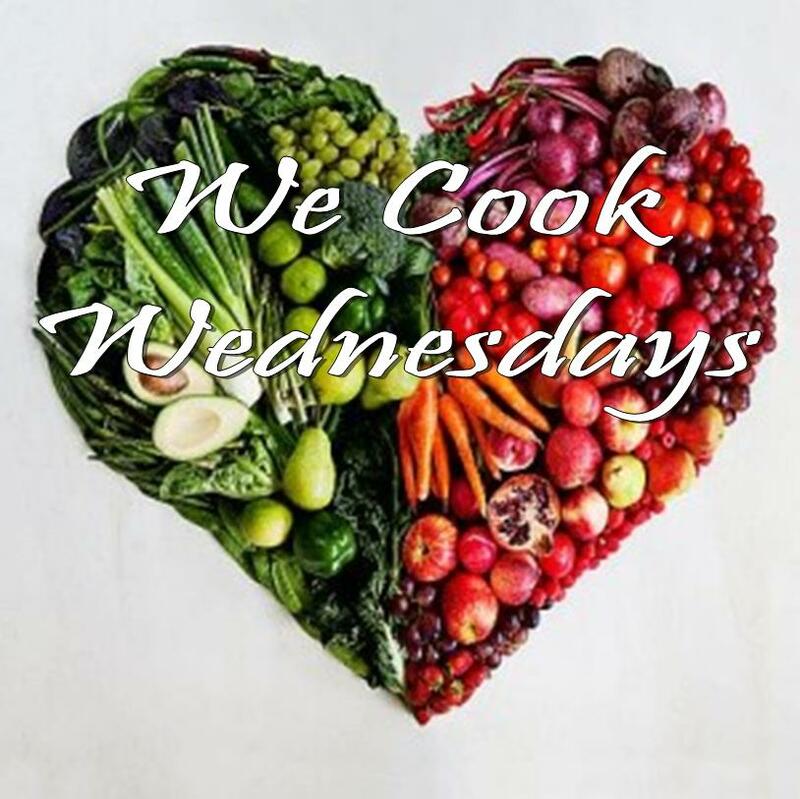 Set oven temperature to 425 degrees F. Prepare a large skillet or glass dish by pouring 2-3 Tbl. cooking oil into it and placing it into the oven while it is preheating. Mix the dry ingredients together in a large bowl. In a separate bowl, mix the wet ingredients. Combine the wet and dry ingredients, mixing only until they are well combined. As soon as the oven is preheated, carefully remove the hot skillet and pour the batter into it. Be aware that the oil is hot and may splatter around the edges a bit. Bake at 425 degrees F for 25 minutes, or until golden brown. PS Serve with honey while it is warm. Enter your email address to follow Positively Shelle and receive notifications of new posts by email. Be yourself. Travel the world. Follow your heart. Faith issues we're trying to live for the sake of Jesus. Live your life like a "fit attendant"